This year's TCBF General Assembly convenes in Memphis, TN on a significant anniversary for our Nation - the 50th anniversary of the assassination of Dr. Martin Luther King, Jr. As the commemoration wraps up in Memphis, CBF Baptists in Tennessee will gather seeking a renewal of Dr. King's vision in our own hearts and communities. We'll consider the gaps that still exist and ask what God would have us to do and who God would have us to be to make Beloved Community a nearer reality. 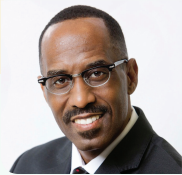 Dr. Kevin Cosby will be our worship proclaimer and dialogue facilitator. Dr. Cosby Serves as Senior Pastor of St. Stephen Church and President of Simmons College, both in Louisville, KY, and is a leader in the Angela Project, a partnership among three national Baptist bodies that will be profiled at the 2019 CBF General Assembly in Birmingham. A pilgrimage to Memphis offers us the opportunity to journey into the gap, to experience the bridges being built, and consider the bridges needed in our own lives and communities. Plan now to join us for worship, learning, fellowship, and transformation!